Once a table has been created, E-DataAid allows the user to copy to the clipboard, exported to a text file for further analysis in another application, or plotted in Excel (Excel 2003, Excel 2007, Excel 2010, or later must be installed on the working machine for this option). Once a table has been created, E-DataAid allows the table data to be copied to the clipboard, or directly to an Excel worksheet. 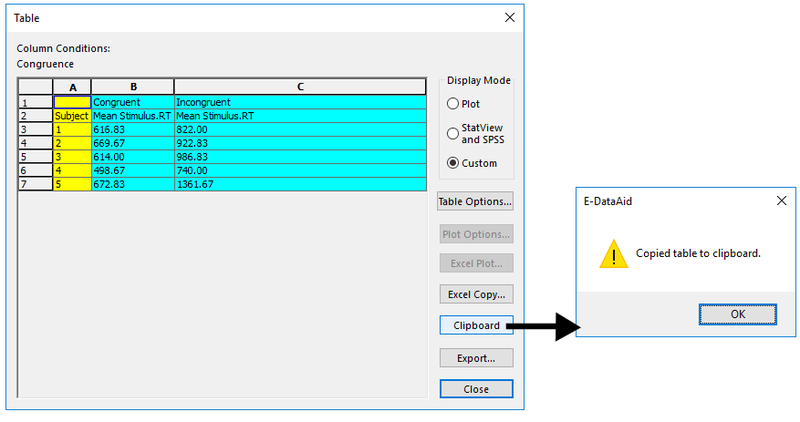 To copy a table to the clipboard, click the Clipboard button on the Table dialog. A dialog appears indicating if the copying operation was successful. Once copied to the clipboard, the table may be pasted into another application (e.g., Microsoft Word, PowerPoint). If Excel is installed on the machine, the table may be copied directly to Excel by clicking the Excel Copy button on the Table dialog. If a workbook is currently open in Excel, E-DataAid will add a new worksheet to the workbook and copy the table to it. If Excel is not open, E-DataAid will open Excel and create a new workbook before performing the copy. The image below displays a table copied from E-DataAid to Excel (see also E-DATAAID: Running an Analysis ). E-DataAid allows a table’s data to be exported to a text file so that it can be imported by another application. This may be useful when performing further analysis on a table. Tables may be exported to Excel, StatView, SPSS, or some other application. If Excel is installed on the machine, the table may be plotted directly to Excel. This feature is only available for tables that calculate one statistic for one variable. Before plotting the table, the table must be in the correct format. 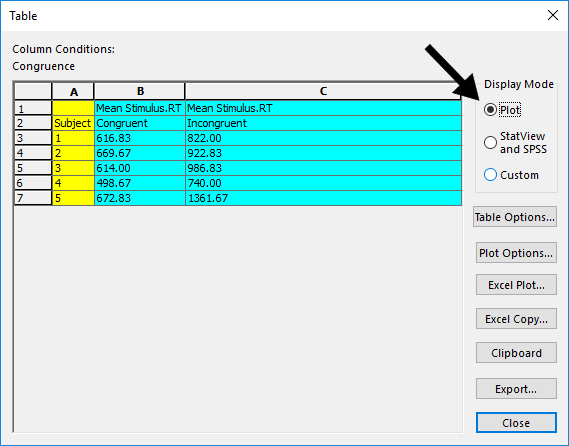 To correctly format the table for plotting to Excel, change the table’s display mode to “Plot.” The Display Mode setting is located to the right of the table. If the table cannot be plotted, this option will be disabled. Once correctly formatted, the table may be plotted by clicking the Excel Copy button. If a workbook is currently open in Excel, E-DataAid will add a new worksheet to the workbook and plot the table to it. In addition to the plot, the application also copies the table to the worksheet. If Excel is not open, E-DataAid will open it and create a new workbook before performing the plot. The picture below displays a table automatically plotted in Excel. Before plotting, it may be necessary to change the plot settings. To change the plot settings, click the Plot Options button on the Table dialog to display the Plot Options dialog. This button is disabled unless the table’s display mode is set to plot. Select the plot type (column or line) as well as the plot orientation (column or row). A column orientation means that the application plots the data series by columns. In other words, the column labels make up the plot’s legend and the row labels make up the x-axis labels. 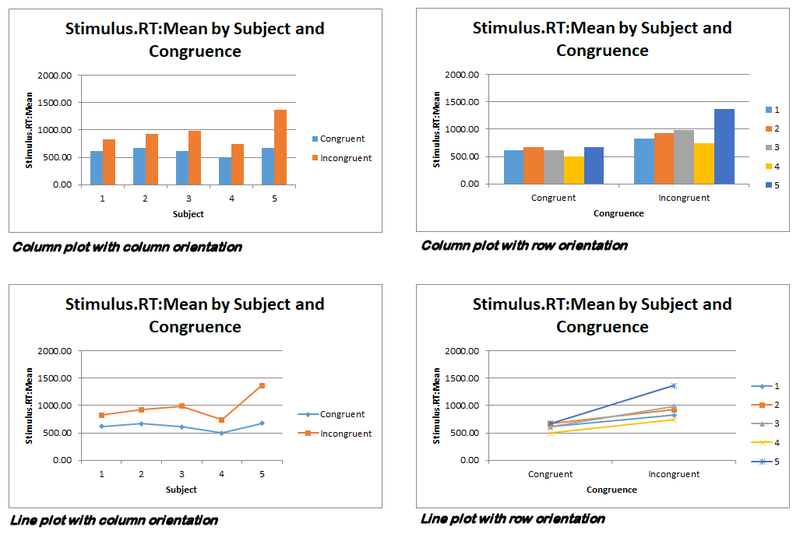 A row orientation means that the application plots the data series by rows. In other words, the row labels make up the plot’s legend and the column labels make up the x-axis labels. 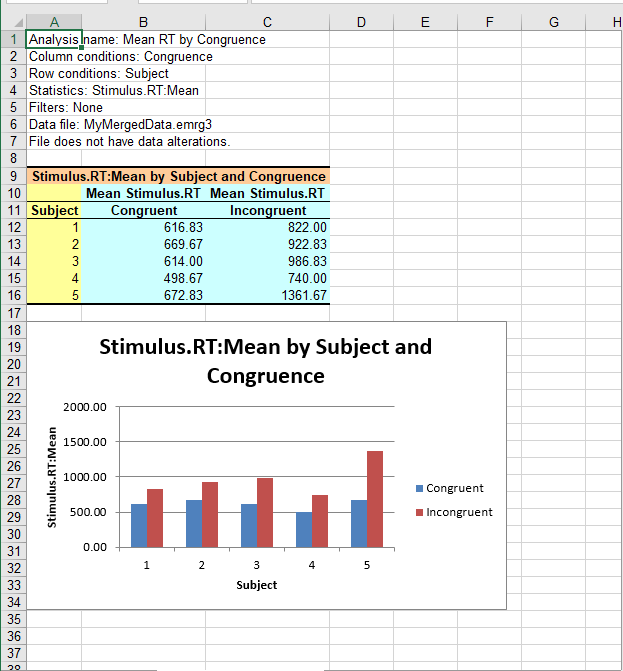 The figures below compare and contrast four different plot combinations for the same table. 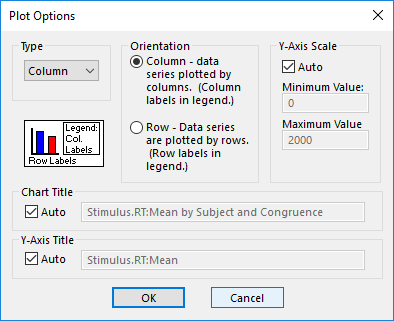 On the Plot Options dialog, the y-axis scale, chart title, and/or y-axis title may be set by unchecking the respective box labeled “Auto” and entering values into the adjacent fields. Note, once the plot has been exported to Excel, settings may be altered using the plot options in Excel.